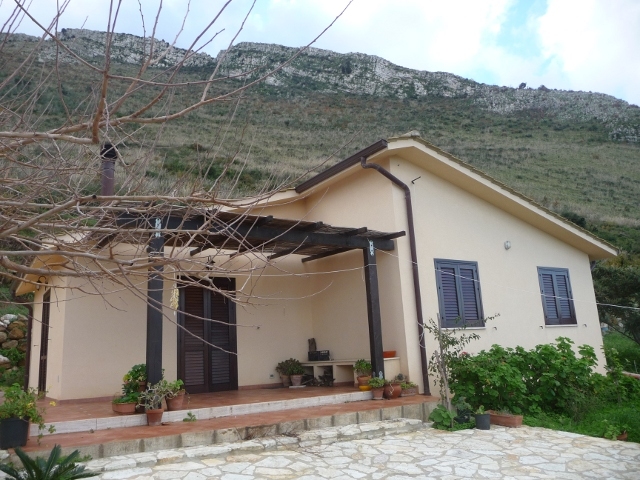 Casa Tre Sorrelle (Three Sisters) is a pleasant little holiday cottage half way up a mountain, overlooking the bay between San Vito and Palermo, and the mountains heading towards Trapani. The view takes in most of the Zingaro reserve, but from the other end to that we’d become used to. 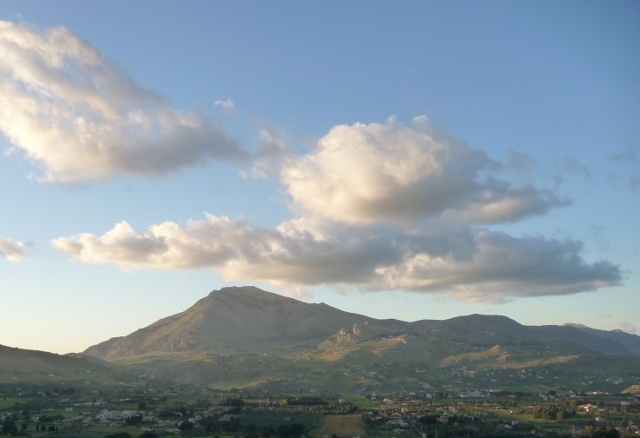 Whilst she was with us, we showed my mother what we hope’s been a good mix of the best of Western Sicily. She arrived armed with a “Best 25 things to see” guidebook – which we were pleasantly surprised to find we’d almost entirely done in our time here. The weather behaved itself (mainly! ), with only the first day seeing any precipitation. It did that in _style_, though… The forecast didn’t look great, so we thought it best to start off with the great metropolis of Palermo. As we left the van in Monreale, and wandered towards the Duomo, we were forcibly reminded that what to us is merely the Best Before date for the tinsel is actually the religious celebration of Epiphany – and the Duomo was, of course, somewhat occupied by a service. Once the bus had taken us to the city centre, we had a wander around some of the central sites – those that weren’t closed for lunch or the afternoon, of course – with threatening skies and the odd short, sharp shower. The Duomo in Palermo was similarly occupied. 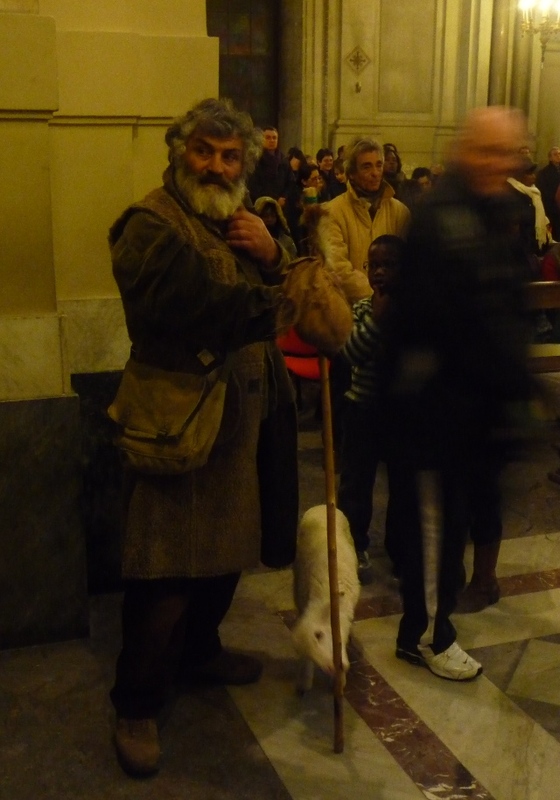 We can’t vouch for any wise men, but at least one of the shepherds was definitely present and correct, lamb following him wherever he did go. We missed the bus back up to Monreale by seconds – due to the front lying about the route number. Shortly after the next left, an hour later, the heavens opened, with one of the heaviest hailstorms I think any of us had ever seen. They didn’t just settle – the road was quite literally white over with stones, as jagged lightning forked across the mountains. The rest of the week saw considerably less meteorological melodrama. We bimbled around, revisiting some of our favourite sites. 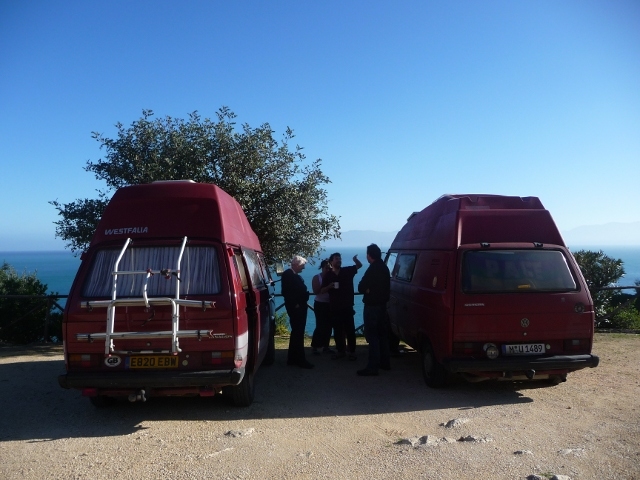 We caught the tail end of the Christmas market at Erice, we revisited Marsala’s market and bought delicious fresh fish, we headed back to Agrigento and the Valle dei Templi. Zingaro, of course, could not be missed – my mother’s a big fan of a long walk, living in the middle of Derbyshire’s Peak District and owning a large and extremely energetic dog. We did get a bit of a surprise, though, when we arrived at the camp site first thing in the morning – only to find that we already appeared to be there. Another dark red VW T25, with high-top, was already parked up. Florian and Nelya had spent the night in the carpark, after the bad weather of our Palermo day had caused their ferry to Genoa to be cancelled. Together with their four-year-old daughter, Marina – and, yes, even the cat – they’d spent a few weeks touring round Sicily over Xmas and New Year, but were heading back home to Munich. They’d been travelling off-and-on for many years, and gave us some very enthusiastic recommendations for places we’d been umm-ing and ahh-ing over as Spring destinations. Watch this space! 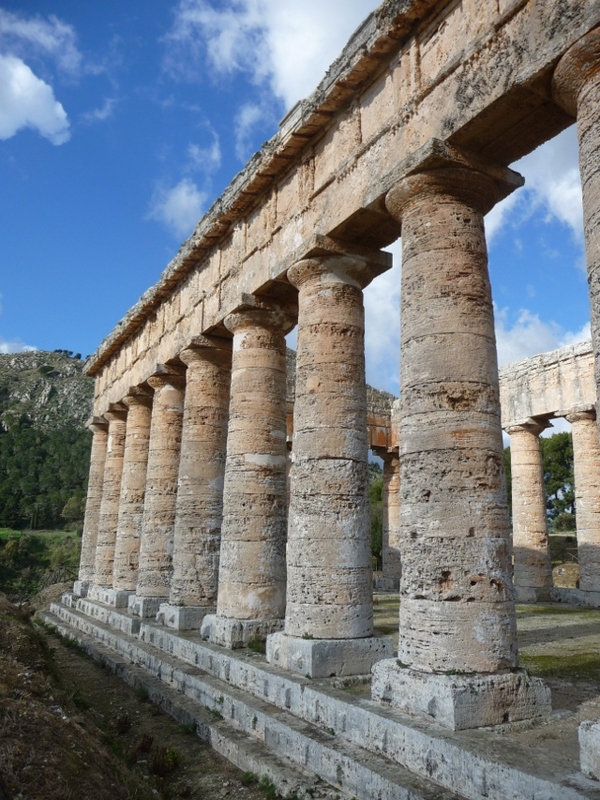 We also ticked off a couple that we’d not got to previously – Segesta’s Greek temple was as magnificent as expected, together with the theatre on top of the hill opposite. The temple was never fully completed, yet has stood the test of time remarkably well. What you see today (more complete than most) is all that was ever there. The inner temple was never built, and there are various clues as to the incompletion – for example, stone studs left on many blocks, there to help manhandling during installation, would have been removed once no longer required. Finally, we took a boat trip from the Marsala salines over to the small island of Mozia, site of a Phoenician city. Rediscovered and excavated by yet another peripatetic English Victorian gentleman, many of the finds are in the surprisingly good museum housed in the small castle he had built on the island. Together with a wander round the ruins themselves, this was a real gem of a day out to finish the week off with. However, our main “Must See” on the island remains unseen. It appears that the Etna excursions don’t run through December to February, with the cablecar being used for skiers instead. 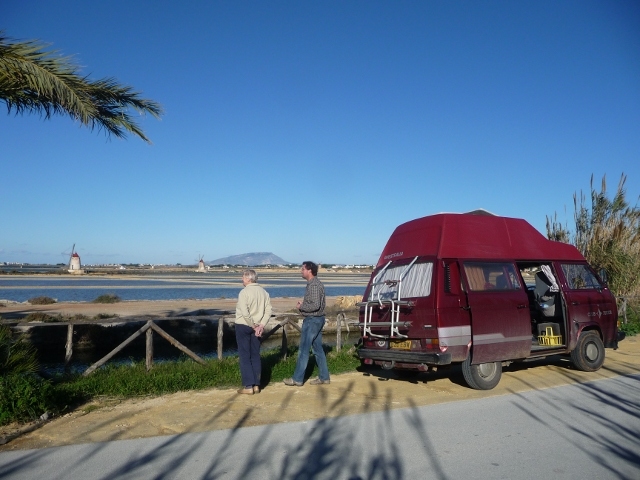 Now that we’re out of the house again, we’ve come back to the Palermo campsite for a couple of nights before an early start on Saturday morning for the ferry to Tunis. By Saturday night, our road will be going in a different direction – we’ll be in Africa! 5 Responses to A van made out of brick? Hi to you Both, Happy New Year. I sm sndicipating that you will be around 20stone after al the delicious Italaion Food. Still enjoying yor blogs. Enjoy thr rest of yout trip. has damaged leg after a f aling, I hope your next trip is as great as theose before. Strangely enough, I’m still way _down_ on weight since leaving the UK. The belt that I had to buy in Spain after running out of holes on my old one is way down to the last hole, too. It’s getting rid of all the bad habits – lack of exercise, big lunch from the sandwich shop, etc. Did you mean “Has E damaged her leg”? No, just a little bit bruised for a few days. If you have a taste for Roman mosaics then the Bardo Museum in Tunis will fulfil your wildest dreams! I particularly remember one of Virgil writing the Aeneid. What other sites will you visit? El Djem is just as good an amphitheatre than the Colliseum but may be off your route. There is little left of the Carthage of Queen Dido but they have excavated the slipway for launching ships in the harbour. I shall await your next update. Good to hear from you, Hugh, and thanks for the tips. We plan to visit the Bardo tomorrow and some parts of the Carthage remains on Wednesday. We are planning to visit all major sights in Tunisia time and political conditions permitting. Posts very soon on what we’ve done so far. Hope all well with you both.